Sydney, Jan 10, 2012 (Global Fashion Wire) - Online fashion hotspot Young Republic has joined forces with A Series Of Fortunate Events to transform monthly pop up fashion night market Bizarre Bazaar into an exclusive online shopping portal, accessible to all. The collaboration will provide emerging designers a chance to fill the laneways of Sydney once a month with their designs, whilst reaching shoppers nationally and globally via the dedicated portal on youngrepublic.com.au. 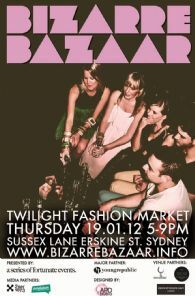 The first Bizarre Bazaar of 2012 will be kicked off by Australian chart-toppers Faker on Thursday 19th January at regular spot Sussex Lane, which will be filled to the brim with unique local and national designers selling individual collections and products to tantalise your style buds. Launching Bizarre Bazaar's 2012 campaign sees a selection of the markets favourite designers take centre stage: Natasha Dwyer, Arthur Ave; Atlanta Reade, ATAT/Chosen By; Curtis Vella & Domenic Quaranta, Fluktu8; Victoria Cheatham, Lotus Mendes; Gail Cowan, Sugarland; and Karen Fulton of Zipporra. The Young Republic team will also be bringing you a handpicked selection from their online Marketplace giving you a chance to explore some of their most exclusive collections from home-grown emerging designers, including: DubbleYou, Fiel Sol, Monolog, Akimbo, Barbarian Gypsy, Amor Amor, Kunynghame, Ham & Pea, Oliveen, Mi Goals, Things by Bean, Ipanema Girl and Green with Jade. "Bizarre Bazaar is an invaluable support platform for emerging designers promoting their labels on a local level," spoke designer Pip Houghton, creative force behind resin jewellery label 'it was me', which also starred in this month's campaign. Bizarre Bazaar supports and connects Sydney's emerging fashion designers by showcasing their designs at intimate monthly markets. With the addition of the Bizarre Bazaar online store via shopping hotspot Young Republic, the project can continue to provide visibility and accessibility to participating designers. Funded by A Series of Fortunate Events, partnered venues and designers for designers, Bizarre Bazaar is a community project that aims to provide valuable public exposure to grassroots fashion designers and strengthen Sydney's love of local fashion.